Set up iterations in the Iterations section of a test case. You can use table iterations or scripted iterations. 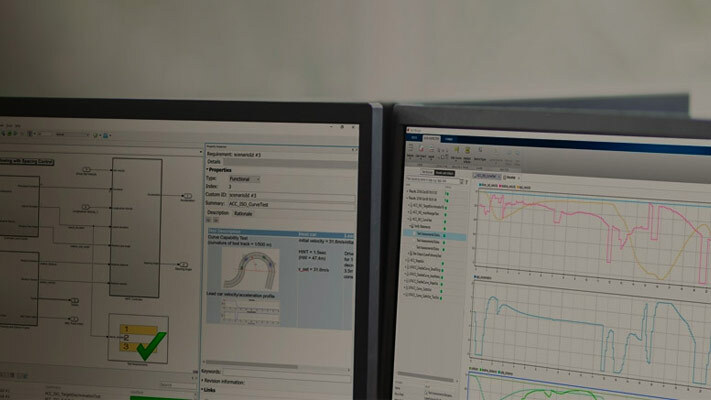 If the test collects coverage using Simulink® Coverage™, the same coverage settings apply to all iterations in the test case. 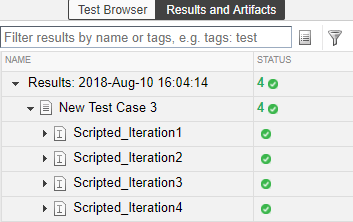 Whether you use table or scripted iterations, you can see the iterations in the test case by clicking the Show Iterations button. Expand the Iterations > Table Iterations section. In the table, add or remove columns by clicking the button and selecting items in the list. For example, to display parameter and configuration sets, select the Parameter Set and Configuration Set items. To manually add iterations, click Add. The table displays a new iteration row. Assign an iteration name and select items for the iteration. For example, this test case has four iterations. Each iteration uses a different combination of external input and baseline data. Click the Auto Generate button. Select items to generate iterations. The model sldemo_autotrans has a Signal Builder block with four signal groups, labeled S1, S2, S3, and S4. The test case has three parameter sets, labeled P1, P2, and P3. Automatically generating iterations from Signal Builder groups and parameter sets results in three iterations. The iterations are limited by the three parameter sets. Each iteration contains one Signal Builder group and one parameter set. 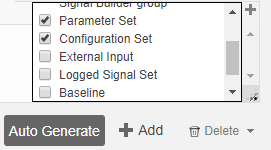 The Signal Builder group and parameter set are matched in the order that they are listed in the Signal Builder block and parameter set section. For example, if you want to include the name of the parameter set, configuration set, and baseline file name, enter ParameterSet_ConfigurationSet_Baseline. Applies to the Inputs section of a simulation, baseline, or equivalence test case, for the specified Signal Builder Group. Each Signal Builder group is used to generate an iteration. Applies to the Inputs section of a simulation, baseline, or equivalence test case, for the specified Signal Editor Scenario. Each Signal Editor scenario is used to generate an iteration. Applies to the Parameter Overrides section of a simulation, baseline, or equivalence test case. Each parameter override set is used to generate an iteration. Applies to the Inputs section of a simulation, baseline, or equivalence test case, for the specified External Inputs sets. Each external input set is used to generate an iteration. Applies to the Configuration Setting Overrides section of a simulation, baseline, or equivalence test case. Each iteration uses the configuration setting specified. Applies only to baseline test case types, specifically to the Baseline Criteria section of a baseline test case. Each baseline criteria set is used to generate an iteration. Applies only to equivalence test case types. At the top of the Auto Generate Reports dialog box, there is a menu for Simulation 1 or Simulation 2. These sections correspond to the two simulation sections within the equivalence test case. You can run a custom set of iterations using a script in the Scripted Iterations section. For example, you can define parameter sets or customize iteration order by using a custom iteration. Scripted iterations are generated at run time when a test executes. An iteration object, created using sltestiteration. An iteration setting, set using setTestParam. The iteration registration, added using addIteration. For example, this script creates an iteration that runs one signal group from a Signal Builder block. You can use predefined variables to write iterations scripts. To see the list of predefined variables in the Test Manager, expand the Help on creating test iterations section. 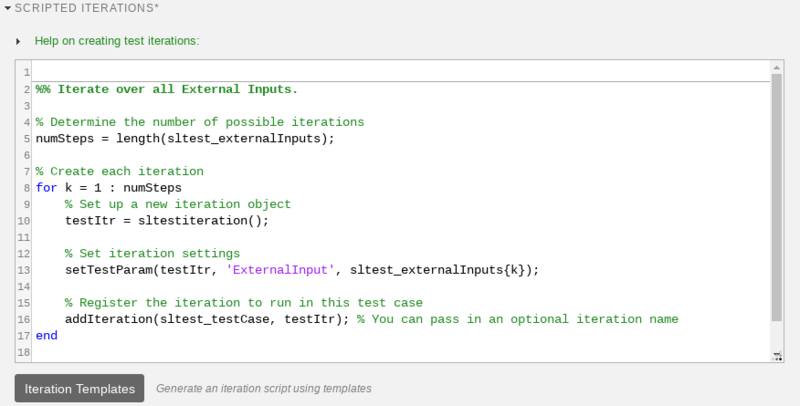 You write the iterations script in the script box within the Scripted Iterations section. The script box is a functional workspace, which means the MATLAB® base workspace cannot access information from the script box. If you define variables in the script box, then other workspaces cannot use the variable. You can quickly generate iterations for your test case using templates for Signal Builder groups, parameter sets, external inputs, configuration sets, and baseline sets, if you are using a baseline test case. Scripted iteration templates follow lockstep ordering and pairing of test settings. For more information about lockstep ordering, see Create Table Iterations. Select the test case settings you want to iterate through. Click OK. The script is generated and added to the script box below any existing scripts. To generate a table that gives a preview of the iterations that execute when you run the test case, click Show Iterations. This example shows how to create a baseline test by capturing data from a test case with table iterations. You create the iterations from Signal Builder groups in the model. Before running the example, navigate to a writable folder on the MATLAB® path. 3. In the Test Manager, right-click the test case and select Rename. Rename the test case Baseline Test. 4. In the System Under Test section, for Model, enter sltestCar. In the Simulation Outputs section, click Add. The Signal Selection dialog box appears. In the model canvas, select the output torque and vehicle speed signals. The signals appear in the Signal Selection dialog box. In the dialog box, select both signals and click Add. The signals appear in the Logged Signals table. Expand the Iterations section of the test case. Expand the Table Iterations section and click Auto Generate. In the dialog box, select Signal Builder Group. Click OK. The table lists the iterations corresponding to the four Signal Builder groups. In the Baseline Criteria section, click the arrow next to Capture, and select Capture for Iterations. Specify a location for the baseline data files. The model simulates for all Signal Builder groups. The baseline data for output_torque and vehicle_speed are captured in four MAT files. Also, each baseline data set is added to its corresponding iterations in the table. Scripted iterations can be used to test a model by sweeping through a set of parameters. 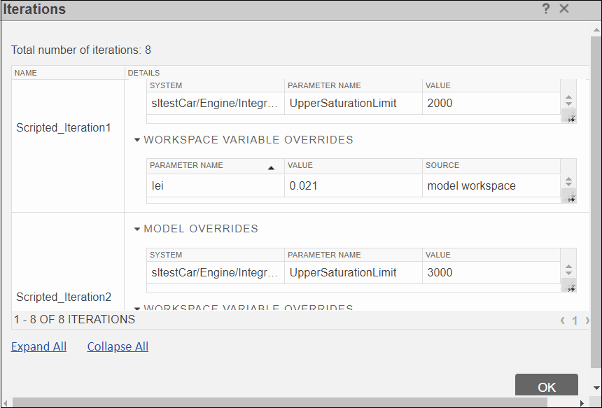 You can use this script to try different values for the model workspace parameter Iei in the model sltestCar. Add the script under Iterations > Scripted Iterations. After you add the script, click Show Iterations. You can see the iterations that the script created. Running the test generates a result for each iteration.